For Mother’s day, my husband and I went to New Smyrna Beach, Fl and had a delightful brunch. Afterward, we walked the beach for miles. I loved the soothing sound of the ocean as the waves formed, crested then crashed. It was low tide, and I walked through much sargassum seaweed. Because of the ecological importance of sargassum, which provides food, refuge and breeding grounds for much marine life, the beaches were not cleaned of this. I got pleasure from watching the little sandpipers run toward the ocean as the water receded, pecking through the sand to find a meal of little snails and crabs. As the water flowed back toward the shore, the sandpipers quickly ran back up the beach. Back and forth these little birds went with the ebb and flow of the water. Since I recently taught a class in painting an abstract ocean scene, I found myself studying the waves; watching the water ripple then swell. I watched the water as it crested and then crashed and took time to watch for the troughs, those low points between the crests. When the water crested, I noted not just the white water crashing over the curl, but also the droplets that were flung up in the air at the peak of the crest. I found myself both relaxed and inspired. Feel free to enjoy some soothing ocean sounds here. 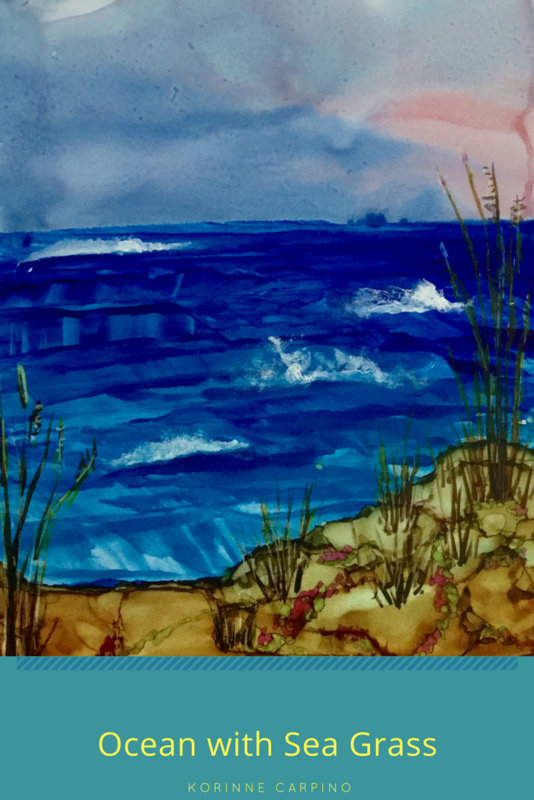 Tomorrow, I am teaching a local class using alcohol ink and yupo to create our abstract oceans. The composition will be created by pouring inks to create the sky then using a key card or an old credit card to paint and create waves. We will pour the beach then use brushes to create the look of dunes, seagrass, and sea roses. Get the code to watch the video! Enter your name and email in the boxes below and get the code for the video delivered to your email.